We are most vulnerable to the lure of junk foods when the munchies strike and we just want a quick snack. These handy, healthful, and portable bars can help you resist the doughnuts in the break room or the pizza, pretzels, and cinnamon buns at the food court. 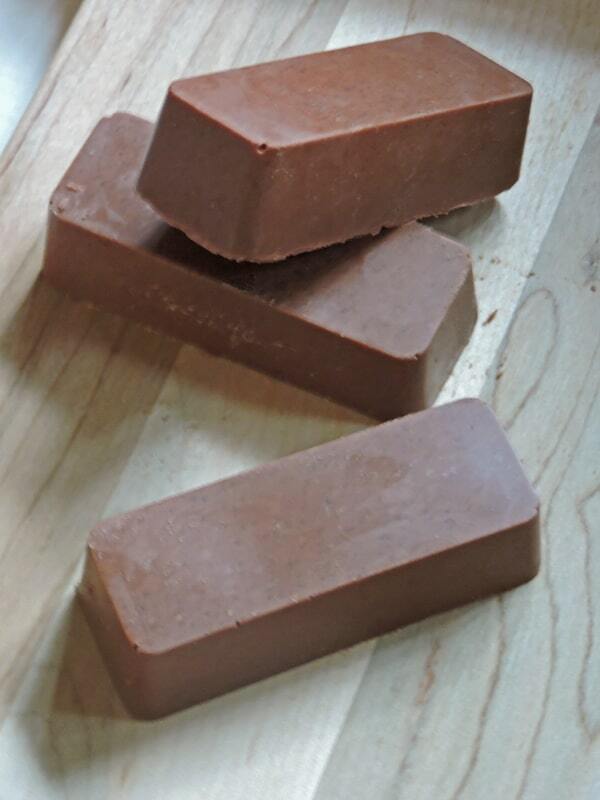 I prefer to make my own bars because it is really easy and I can control what is in them. I use quality ingredients and my bars are not cooked so those ingredients stay fresh and the fats don’t oxidize. Better yet, my husband agrees that mine taste better than the bought ones! 2 tablespoons of sugar-free sweetener with bulk, such as erythritol, oligofructose, xylitol or a blend. ¼ cup coconut butter (not coconut oil)* or nut or seed butter** See Note below. Optional add Ins: sugar-free chocolate chips, chopped nuts, sesame or chia seeds, flaked coconut, etc. Place container of coconut butter in warm water until softened. If using nut or seed butter instead, let it come to room temperature. Gently melt coconut oil or pasture butter. Add coconut or nut butter, coconut oil or pasture butter, optional MCT oil, and vanilla to processor bowl. Process until blended and smooth and no streaks remain. If using add-ins, pulse once or twice to distribute or stir in by hand after blending. 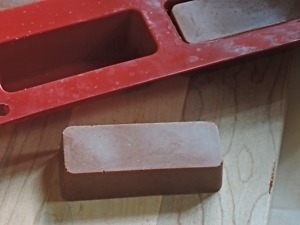 Scrape mixture into 4 molds for making bars or use mini-cake pans. (I used a silicone muffin pan with 1-x 3-inch rectangular cups. The bars are easy to remove from silicone.) Chill until set and pop out of molds. Alternately, line a 3- x 5-inch loaf pan with parchment paper that overhangs the pan on two sides so the contents can be lifted out. Cut crossways into 4 bars after they set up. Wrap bars in waxed paper and then overwrap in foil. The sweetener is not included in the counts as it will vary with choice. Most are indigestible fiber and will have zero carbs. For this recipe, you need the kind of coconut butter that contains ground coconut, not just fat. It may be called “coconut manna.” Coconut oil is sometimes called “coconut butter” when it is solid (above 76 degrees) and coconut oil when it is liquid, below 76 degrees. The recipe calls for both kinds, but they are not interchangeable. ***The optional MCT oil is a healthful addition, but it may make your bars softer since it remains liquid even in the refrigerator. You can use more MCT if you like, but you may need to refrigerate your bars to keep them firm. Greater Flexibility and Mobility – Upgraded Collagen makes the main building blocks of connective tissue more bio-available and better absorbed into joints for greater flexibility and mobility. Build Muscle – Upgraded Collagen supports muscle-building by facilitating the synthesis of creatine in the body. Disclaimer: I am not an affiliate of the companies that make the products mentioned above and I have not received free products from them. Benefits of collagen, Cooagen, Protein bars, Snack bars. Bookmark. Like the new digs…I saw the macros for this recipe first, then went back to see how much collagen is in it. Can the amount of collagen powder be cut in half (or more) to lower the protein, and would it disturb the integrity of the recipe? I’m asking because we have a rampant gluconeogenesis problem here. Hi Wenchypoo. You can really use any amount of any ingredient as long as the bars come out firm enough to hold together and I think the coconut oil would do that by itself! Glad you like the new site. It was a lot of work and a steep learning curve. Sorry–left out the “per serving” part. Wow, that’s a lot different from mine! Does it include all the ingredients? It includes the listed dairy-free ingredients with coconut oil and MCT oil options (I have dairy allergies). I understand people can enter recipes on a variety of sites and get a variety of macros, so don’t sweat it. SparkRecipes will be different from MFP, and the NDB will be different from all of them. Since I now know I can lower the dose of collagen powder, I’m going to do just that. Aha! I also subbed stevia glycerite (to taste) for the powdered sweetener listed in the recipe–that might be the difference. Stevia glycerite is the only sweetener that doesn’t raise my BG to immense proportions. That may be the difference–stevia glycerite is non-caloric. That could explain it. Glad to know that worked, though! Does gelatin instead of collagen work? It might not hurt the recipe, but the collagen has additional health benefits. Thanks for the comment! What pan did you make yours in? The only silicone mold I could find has 9 openings (it’s red…). I got 6 bars rather than 4. Also I messed up on my butter. Instead of cocoNUT butter I used cocoa butter. And ideas on how this changes the nutrition of the bar? Or how bad a screw up it was? I ordered the red mold in the picture on Amazon. You could really use anything, even a cupcke pan, since the size and shape won’t matter. The silicone ones make the bars easier to remove, however. Cocoa butter is much harder than coconut butter, so your bars will be firmer–you could probably melt them down again and add something to soften them, like a little oil, if you don’t like the way they came out. The nutrition data is probebly similar using either coconut oil or cocoa butter since both are just fat. Thank you so much for doing the work to make this great recipe! Thanks, Julie, glad you enjoyed them.